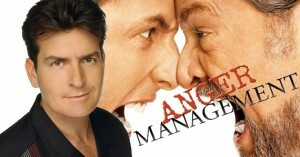 Charlie Sheen Will Return to Television in ‘Anger Management’!!! Los Angeles, July 18, 2011 — Former Two and a Half Men star Charlie Sheen is planning his return to series television in Anger Management, a new sitcom loosely based on Revolution Studios’ 2003 hit comedy feature of the same name. Lionsgate-owned Debmar-Mercury, headed by Co-Presidents Mort Marcus and Ira Bernstein, will distribute the series that will be produced by Lionsgate Television, led by Television Group President Kevin Beggs and COO Sandra Stern; Joe Roth and Revolution Studios’ Vince Totino; Sheen manager Mark Burg’s production company, Evolution Management; and Robert Maron. Sheen will retain a significant ownership stake in the series inspired by the film, in which a mild-mannered, non-confrontational man is ordered to attend group anger management sessions led by a therapist who could probably use some anger management himself. Roth and Sheen have worked together on five features, including Major League, Young Guns and Three Musketeers. Roth is also currently working with Lionsgate’s Debmar-Mercury and Ice Cube’s Cube Vision on the TBS hit Are We There Yet? It is one of three hugely successful sitcoms (along with Tyler Perry’s House of Payne and Meet The Browns) that are the result of a unique sitcom business model created by Marcus and Bernstein. The deal was negotiated on behalf of Debmar-Mercury and Lionsgate by Sandra Stern. Sheen was represented by Jake Bloom and Leigh Brecheen of Bloom, Hergott, Diemer, Rosenthal, Laviolette & Feldman. Revolution and Joe Roth were represented by Matt Johnson of Ziffren Brittenham LLP. Charlie Sheen, who has starred in more than 40 feature films, catapulted to fame in such critical and commercial hits as Platoon and Wall Street. His other feature film credits include Major League, Red Dawn, Lucas, Ferris Bueller’s Day Off, Eight Men Out, Young Guns, Hot Shots!, Hot Shots! Part Deux, The Three Musketeers, The Chase, Money Talks, Being John Malkovich, Scary Movie 3, Scary Movie 4 and The Big Bounce. He also appeared in the television movies Rated X and Good Advice. Sheen became known to television audiences through his Golden Globe Award-winning lead role in Spin City. In 2003, Sheen was cast as Charlie Harper in the CBS sitcomTwo and a Half Men, which was loosely based on Sheen’s bad boy image. The role garnered him an ALMA Award and three Emmy Awards, as well as two Golden Globe Award nominations for Outstanding Actor in a Comedy Series. In 2011, Sheen set a new Guinness World Record for Twitter as the “Fastest Time to Reach 1 Million Followers,” adding an average of 129,000 new followers per day. On March 10, 2011, Sheen announced a 22-date nationwide tour, “My Violent Torpedo of Truth/Defeat Is Not An Option,” which kicked off in Detroit on April 2. The tour sold out in 18 minutes, a Ticketmaster record. I really think Charlie Sheen was such a great actor. His personal life has made him a joke, but hopefully he can turn it around. I would love to see him shine again. Not sure if this is the right format for it, but hopefully it is a step in the right direction. But this project is in the very early stages right now. There is no network yet or series writer, but I expect that to be announced shortly. This entry was posted on Monday, July 18th, 2011 at 12:25 pm	and is filed under Film, News. You can follow any responses to this entry through the RSS 2.0 feed. You can skip to the end and leave a response. Pinging is currently not allowed. « Soderbergh’s ‘Contagion’ Gets A Trailer!!! !